Candice Breitz’s urgent video installation Love Story interrogates the conditions under which empathy is produced. Whose stories are we willing to hear, and how must stories be packaged before we can feel them? What kind of stories are we willing to hear? What kind of stories moves us? Why is it that the same audiences that are driven to tears by fictional blockbusters, remain affectless in the face of actual human suffering? Love Story, a seven-channel installation by Candice Breitz, interrogates the mechanics of identification and the conditions under which empathy is produced. The work is based on the personal narratives of six individuals who have fled their countries in response to a range of oppressive conditions: Sarah Ezzat Mardini, who escaped war-torn Syria; José Maria João, a former child soldier from Angola; Mamy Maloba Langa, a survivor from the Democratic Republic of the Congo; Shabeena Francis Saveri, a transgender activist from India; Luis Ernesto Nava Molero, a political dissident from Venezuela; and Farah Abdi Mohamed, an idealistic young atheist from Somalia. It evokes the global scale of the so-called ‘refugee crisis,’ evolving out of lengthy interviews conducted with the six participants in the countries where they are seeking or have been granted asylum (two interviews took place in Berlin, two in New York and two in Cape Town). The personal accounts shared by the interviewees are articulated twice by Love Story. 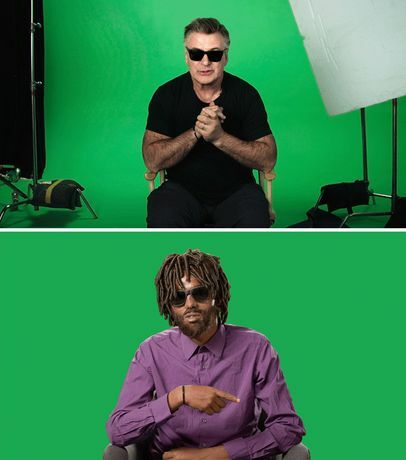 In the first space of the installation, re-performed fragments from the six interviews are woven into a fast-paced montage featuring Hollywood actors Alec Baldwin and Julianne Moore (who are cast in the work as themselves: ‘an actor’ and ‘an actress’). Each was asked to channel excerpts from three of the first-person narratives on a green-screen set, without the support of fictional backdrops, costumes, props, accents or interlocutors. Breitz’s edit intertwines the six renditions, plotting the diverse socio-political circumstances and personal experiences that prompted the interviewees to leave their countries. Her polished restaging of the six stories strips the source interviews of their depth and nuance, of their imperfect grammar and accented English, provocatively mimicking and exposing the logic by means of which ‘true life stories’ migrate into popular entertainment. In a second space that is accessible only via the first, the original interviews unfold across six suspended screens in their full duration and complexity, now intimately voiced by the individuals whose lived experience they archive. Suspending viewers between the gritty firsthand accounts of people who would typically remain nameless and faceless in the media, and an accessible drama featuring two actors who are the very embodiment of visibility, Love Story raises questions around how and where our attention is focused. The work deploys the hypervisibility of Moore and Baldwin to amplify stories that might otherwise fail to elicit mainstream attention or empathy. At the same time, it reflects on the callousness of a media-saturated culture in which strong identification with fictional characters and celebrity figures runs parallel to a widespread lack of interest in people facing real-world adversity. Candice Breitz (b. 1972, Johannesburg) is one the most powerful voices on the contemporary art scene. Her ambitious video installation Love Story was one of the absolute highlights of last year’s Venice Biennale. Thanks to the generous support of the New Carlsberg Foundation the work is now part of ARKEN’s collection.